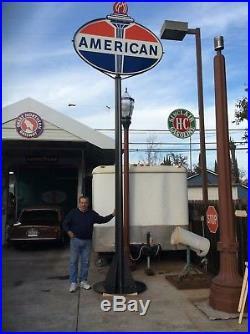 American Double Sided Porcelain Sign & Pole from the late 30's. One tiny chip on one side of this sign. Stand: 20 Ft Tall / Estimated weight 600 lbs total. 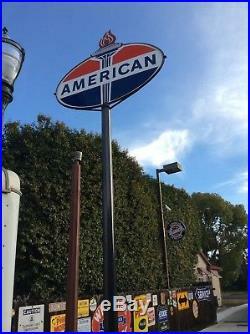 Oval Sign: 6ft 2 inches wide x 3ft 8 1/2 inches. 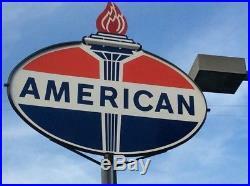 The item "AMERICAN PORCELAIN STANDARD OIL & Gasoline Flame Vintage Sign" is in sale since Monday, January 29, 2018. 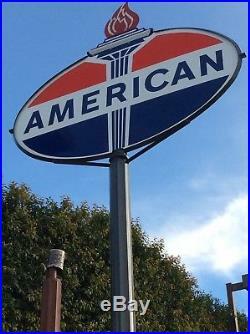 This item is in the category "Collectibles\Advertising\Gas & Oil\Merchandise & Memorabilia\Signs".liddiard2010" and is located in Stockton, California. This item can't be shipped, the buyer must pick up the item.